This is the last spread in our road trip across the United States. By this point I had been driving for 4 days and I was pretty exhausted. I was forgetting to take pictures, and frankly there wasn’t too much to take pictures of in Kansas anyway! But I did remember to take a picture at the Welcome Center at the border of Kansas, and the attendants inside gave me a packet of sunflower seeds! So that was about all I had to put in the scrapbook. I was trying to figure out what I was going to do with this spread when I discovered this wonderful sunflower background paper and just decided that this whole spread would be themed in yellow. Don’t be afraid to use a full page picture like this, especially if it helps to drive home the point of your theme. 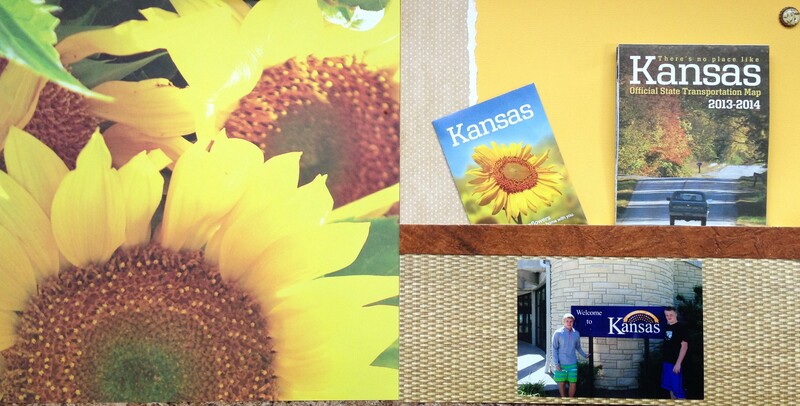 On the right hand page I attempted to create a feel of a basket which also served as a holder for the Kansas map. I put the entire packet of sunflower seeds (including the seeds!) on the page and glued them down. They are now in Sweden so I hope that I didn’t break any international laws about seeds!